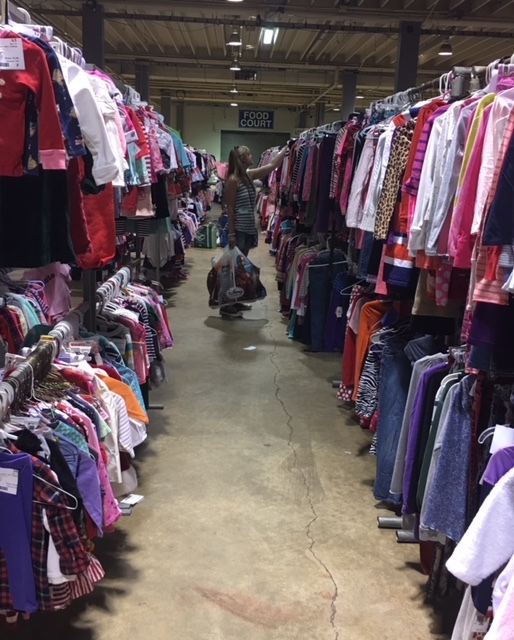 I’ve only been a seller twice now in the Charlotte Mother of Multiples Consignment Sale, but I can imagine I’ll have the exact same feeling the next 10 times (or more?!) I decide to participate. It’s three days before the sale starts. The clock is rapidly approaching a midnight deadline to enter our sale items online. I’m up to my ears in baby and maternity clothes. I still have 150 price tags to print out and attach over the next 48 hours, and my computer decides to crash two hours before the tagging deadline. It feels like finals week in college. Why did I decide to sell again? Why not just bag everything up and drop it off at Good Will and call it a day? Surely I’m not going to make a whole lot of money anyway. Then my computer comes up again, and I get back to work. 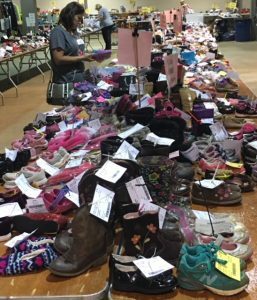 Shoes and more shoes…and some nice finds on winter boots! That’s because I know why I did this again. Because it’s for a good cause. A portion of the sale proceeds go toward helping twin moms and others in need. Because it gives me a deadline to get off my rear end and go through all those old clothes, toys and gear. It forces me to de-clutter and let go of sweet little outfits like the preemie-sized onesie and hat with giraffes all over it. Because it feels like a team effort after people like my mom and husband pitch in to help me get things tagged, loaded and hauled down to the Park & Expo Center. And because I’ve vowed that whatever money I make in the sale will go into our three sons’ college funds. I don’t expect it to be much, but whatever it will be is something tangible I can do for their future, while living on a tight budget. Then the actual sale arrives. And at last weekend’s CMOMs Fall/Winter Sale, I added another reason. Because it’s….fun! Now that my twins, Johnny and Wes, are 10 months old (and my oldest son Wade is 2 ½) I can see straight, so I decided to work my first volunteer shift at the sale. The CMOMs let you keep a little bigger piece of the pie if you volunteer for at least one shift. Another perk of volunteering is you get to be among the first group of shoppers, after the expectant moms of multiples. And who doesn’t love to shop? 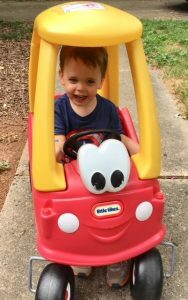 I bought a Cozy Coupe toy car I knew Wade would love, an ExerSaucer to match the one we already have for double the fun for Johnny and Wes, and I knocked out Christmas pajamas for everybody, a winter coat and some school clothes for Wade, and more. My total at the cash register was $130. Hey, that’s a lot of stuff for $130! But the heat was on. Was I going to make more than $130 with what I sold? Walking back in for my volunteer shift, I saw somebody hauling our baby swing out to her car. Cha-Ching. Here we go. I spent my shift standing at the front of a very busy checkout line, directing people to go to either the cash or credit registers. I loved it. 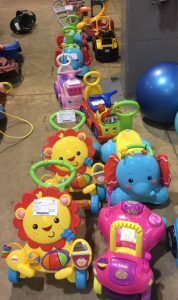 I got to chat with twin moms and their friends who got to shop early (the sale opens to the public on Saturday morning.) I got to see everything people purchased (why the heck didn’t I think to buy Halloween costumes? Why didn’t I grab an extra set of baby gates?) And here I was, a busy mom, who struggles to make time for anybody but my three boys, getting a chance to do something for somebody else and to socialize while I was at it. Oh, and I got to see how organized, efficient, and awesome the women are who make up CMOMs. Not only is the sale a well-oiled machine, just watching these women work – and shop! – was inspiring. 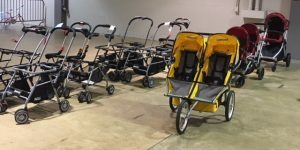 What’s pulling a wagon loaded with loot and three bags full of clothes around a convention center, if a woman can feed, bathe, clothe, and raise kids two (or more) at a time? By the time I walked out the door at the end of my shift – I was home and in bed by 11:30 because CMOMs aren’t unreasonable; the work was done – I already knew I’d made the right decision to sell. All I had to do now was sit back and wait to see how much money I would make. 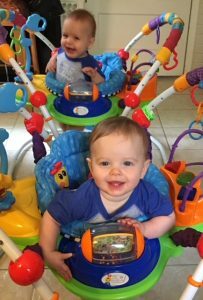 Our bassinet, baby beach tent and two activity mats had sold. So had a bunch of Kissy Kissy outfits, maternity jeans, and a nursing pillow. 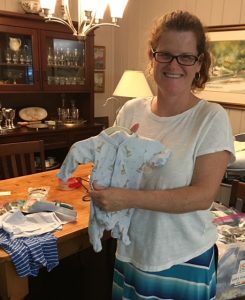 The one category I noticed that really hadn’t sold was preemie clothes, and I know why. Nobody who is pregnant thinks her baby is going to be premature. Who would? But that sweet little giraffe outfit is going to go to a new mom who really needs it. And that’s fine by me. I scanned to the bottom of the report and saw my final take-home tally: $230. I was going to walk away with a net of $100. That’s a lot of time and effort for $100, isn’t it? No doubt. But then again, 17 years from now, that $100 is going to be worth a lot more than that in some 529 accounts. And I’ll be adding to the total in another six months, this time psyched up to make even more. Come early February, when the CMOMs hold the Spring/Summer sale, I’ll be selling again. I loved the consignments when the trips and Jonallen arrived all at once. They supplied all the toys and books and I recycled when they entered the next phase.